A State of Emergency: Oregon Leads the Nation in Incidents of Hate Per Capita. A recent report published by the Southern Poverty Law Center (SPLC) describes a country under assault, assault from within. One of the side effects of the presidential election is that every four years our nation is reminded of the issues that divide us, and rather than rallying around the similarities and shared values of our nation, we are propelled to split friends, pick sides, and focus on our disagreements. In a country as diverse as ours, disagreement is natural and good, debate is good. In a civilized society debate is the only way to grapple with our toughest issues and reach a compromise or consensus. Unfortunately, the country described in the report from the SPLC isn’t a country reaching a compromise; regrettably the country described isn’t even a country of debate. The country described in the report from the SPLC is one where disagreement and debate are being replaced with acts of hatred and blame. In the ten days following the November 8th election there were close to 900 reports of harassment and intimidation in the United States, with Oregon producing 33 of those acts. 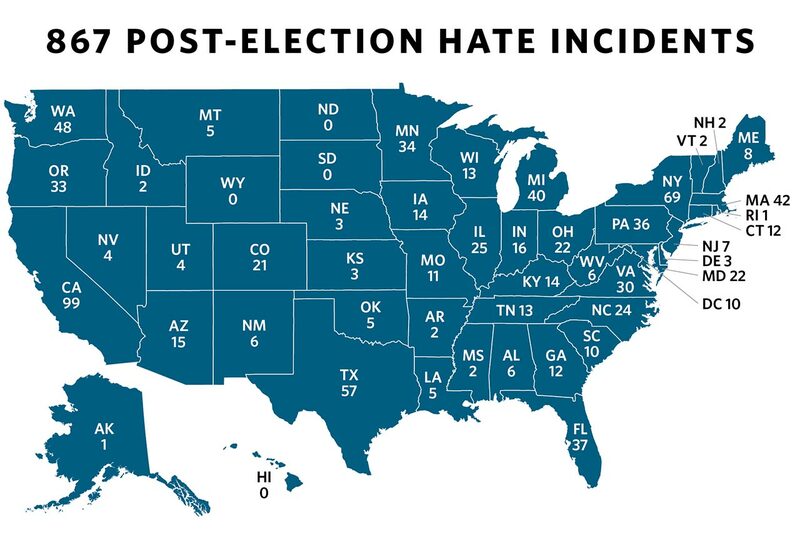 That places our state as the Nation’s leader in incidents of hate per capita, a statistic that the Oregon AFL-CIO cannot ignore. In the days following the report from the SPLC the Oregon AFL-CIO drafted and presented its board with A Resolution to Act Against Hate Incidents and Crimes in Oregon. Alongside the resolution the Oregon AFL-CIO has vowed to provide a hotline to receive and record calls regarding incidents of hate, so that workers in the state of Oregon have somewhere to turn when they are faced with workplace discrimination. The goal of the hotline is to ultimately reduce the occurrence of workplace discrimination and incidents of hate by creating a formal report of every incident and relaying that report to the appropriate governing body of the employee so that justice can be served. Equality For All Workers Is A Consistent Theme From The Beginning Of The AFL-CIO. December 1st marks the 61st anniversary of the AFL-CIO and you can hear the speech from George Meany addressing the AFL-CIO's first convention on the AFL-CIO Now Blog. Take note the themes of equality and respect for all workers, a sentiment shown at the very first address in New York and echoed still with our Resolution to Act Against Hate Incidents and Crimes in Oregon. We dedicate ourselves to improving the lives of working families, bringing fairness and dignity to the workplace and securing social equity in the Nation. We will prevail by building a strong, free and democratic labor movement. We will organize workers into unions allied by common purposes and mutual reliance. We will recruit generations of organizers, amass resources to sustain their efforts and inspire workers to achieve dignity and security through organization and collective bargaining. We will generate broad understanding of the necessity of organizing among our members, our leaders and all unorganized workers. We will give political voice to workers in the ­Nation. We will fight for an agenda for working families at all levels of government. We will assemble a broad progressive coalition for social and economic justice. We will create a political force within the labor movement that will speak forcefully and persuasively on the public issues that affect our lives. We will enable workers to shape a changing global economy. We will speak for working people in the international marketplace, in the industries in which we are employed and in the firms where we work. We will expand the role of unions to securing worker influence in all the decisions that affect our working lives, from capital investment to the quality of products and services to how work itself is organized. We will establish unions as active forces in our communities. We will make the voices of working families heard in our neighborhoods. We will create vibrant state, local and community labor councils. We will strengthen the ties of labor with our allies. We will speak out effectively and creatively on behalf of all working Americans. With confidence and trust in the inherent power and goodness of our people and in the virtue and promise of unionism, we proclaim this Constitution.